Nutria are immediately memorable if you get a look at their faces. The rodent's size is noteworthy — about the size of a beaver. The thing, though, is the teeth, bright orange lengths popping down from their mouths like a pair of sharp Hawkins Cheezies. Lord knows the evolutionary benefit they provide; if they're actually a hindrance in any way, their chompers haven't slowed them down that much, according to the new documentary Rodents of Unusual Size. The cinematic survey of the animals finds them in Louisiana, far from their original homes in South America. Through a sharp animated introduction narrated by Wendell Pierce, we learn they were first brought to the state for their fur and the ease of raising them. During a storm, they either escaped from their cages or were released. Ever since, they have been literally pulling up the land by its roots, turning vibrant coast to mud that eventually gives way to the waters of the Gulf of Mexico. Rodents isn't taking the animals' view of the situation –– there's never a GoPro strapped to a nutria as they climb through a sewer pipe into someone's home. The trio of directors working on this film –– Quinn Costello, Chris Metzler and Jeff Springer –– dig up episodes of how the rodent has burrowed its way into the local culture. The collection of characters runs long. They talk to hunters who rely on the five dollars per tail they get from the government, who are trying to keep this population in check. They stop in with a group who, despite the anti-fur stigma, are trying to brand nutria as the environmentally sound animal to wear. 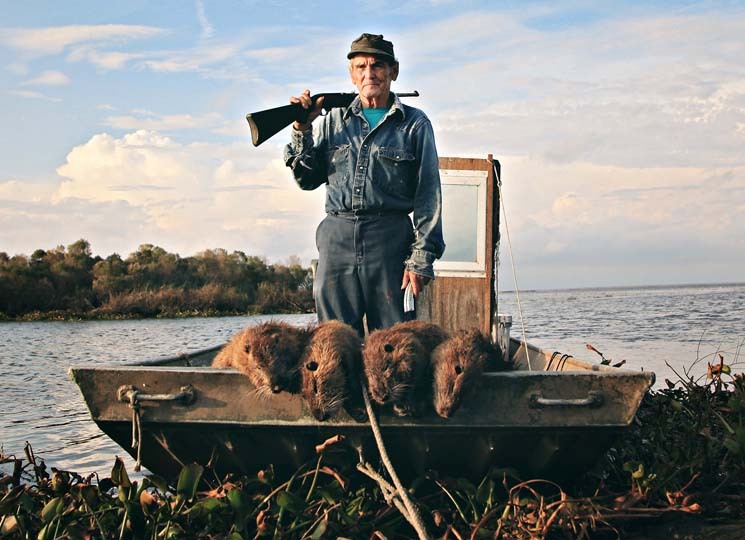 They even dig up one trapper trying to keep the animals away from a golf course and the locals who thwart his efforts, even if nutria are an invasive species destroying the local ecology. The directorial trinity here pulled together a piecemeal film, with episodes going further and further afield toward mild curiosities as the runtime goes on. Even in this general overview, though, they find some threads to pull together in the prevailing attitudes of the people. Different feelings towards the rodents are charted, of fondness and disdain both. The subjects in Rodents are in the odd position sometimes of acknowledging the future danger nutria represent, of detailing what they've already lost, and, in nearly the same breath, saying how they currently rely on them for money or sustenance. They're also a people haunted by ever-worsening weather events looming over them. They find the conventional benefits of a trip to Louisiana, too, where local flavour is a lot more tasty. In the regional accent, phrases like "My daddy used to buy from Bimbo's daddy" don't need to have any more meaning than hearing those words spoken aloud. In keeping with that ambiance, the film is scored by the Lost Bayou Ramblers, who are able to pick up with some Cajun energy when needed and seem just as comfortable in the film's quieter, contemplative moments. There's contemplation in abundance. Rodents of Unusual Size finds people who are slow to adapt, if ever. Their ways of life are passed down generation to generation, traditions born of culture but also a particular communion with the land. There isn't much hope in anything but them slowing the march of nutria. If you root for the rodents, though, you'd be in luck –– I'd bet on them taking the world any minute now.